Heavy-duty kick plate, made from 16-gauge Type 304 Stainless Steel is cut to a variety of heights and widths to fit any standard size door. Ideal for protecting your doors from wear and tear associated with heavy foot traffic. A419 Liquid Nails Page, Click Here! How thick are your Stainless Steel Kickplates? Will your 22 gauge steel kick plate 6x36 flex 3" on the 36" direction. I want to attach to a curved refrigerator door. Also how are the edges finished? 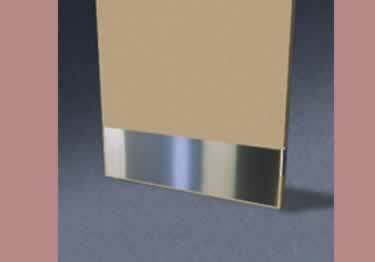 Protect the bottom of doors from heavy foot traffic while providing them with a decorative accent of Stainless Steel. These metal kick plates can be drilled or installed with adhesive. Plate arrived well-packaged and in perfect condition. Size is perfect, and pre-drilled holes and included screws made for easy installation. Thanks. Thank you for your review and we're glad you were happy with the buying experience. If you ever have any questions about this or other products feel free to give us a call. Yes the kick plate came quick packaging was great. also the selection was great this company has a lot of product that we can use in our building. I will be looking forward to be ordering from you again. Had a wide selection of sizes needed. Shipped fast. Great Service. THe size selection and the quality for the price is awesome! I have looked at lots of places and no one has the size options or great prices.